Home > Shredders > Dahle Shredders > Why Buy Dahle Shredders? 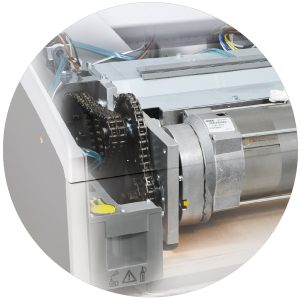 Why Buy A Dahle Shredder? When you buy a Dahle Shredder - you're getting exactly what you expect - quality and performance. Building upon Dahle's well known reputation for superior office equipment excellence - quality and performance remain the top priorities for the Professional Series and CleanTEC Series of shredders. The new line up of paper and multimedia shredders offers dependable and reliable jam free shredding to fit the needs of every office - small and large. Low security strip cut for bulk destruction. Medium security cross cut for most general business use. High security cross cut for top secret and other sensitive Government of Canada document destruction. Dahle shredders offers a host of new features, built upon the same commercial business quality you've come to expect from the brand name - Dahle! The Dahle Shredders are built with longevity in mind. Unlike other shredders on the market, the internal drive components are made from metal. The motor on each model drives the cutting mechanism with full power - eliminating overload and jams with large batches. Most other brands on the market use a plastic gear system only which can easily break down, requiring ongoing service and support. The waste cabinets are manufactured from solid wood with a durable laminated finish. This ensures your equipment looks newer - longer! 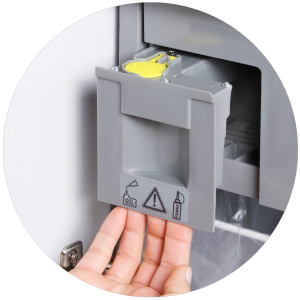 Most other brands on the market use waste cabinets made from thin plastics, which can easily break when moving the shredder. 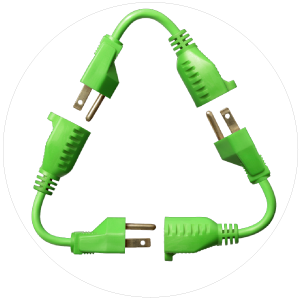 Plastic also doesn't deteriorate in land fills, so Dahle is better for the environment over-all. 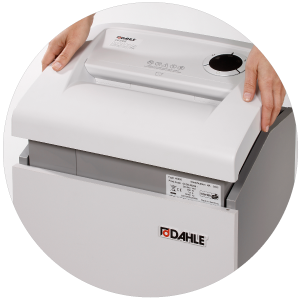 Most likely, given the design and construction of Dahle, you'll never need to replace your shredder anyways. 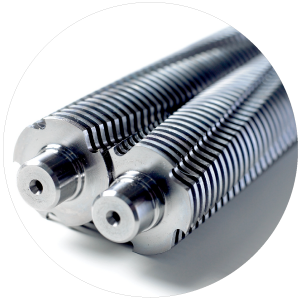 LIFETIME WARRANTY - Strip Cut and Cross Cut shredding cylinders from Dahle are manufactured using a single block of German Solingen Steel. This hardened steel is well known in the print and processing industry because of its durability and its quality for a long cutting life (remains sharper longer). The other benefit is - low maintenance. Other brands of shredders on the market use a "blade system" on a cylindrical drive shaft, which can break down easier. Essentially single thin blades are stacked side by side on a cutting shaft with spacers in between each blade. The blades on this type of equipment are thinner and prone to wear quicker. They become loose over time with use, and if a single blade breaks - it can affect the whole cutting system in seconds. To replace a blade assembly system on these types of models can be quite costly. Not the case with most Dahle Shredders - cutting cylinders are COVERED UNDER A LIFETIME WARRANTY!!! 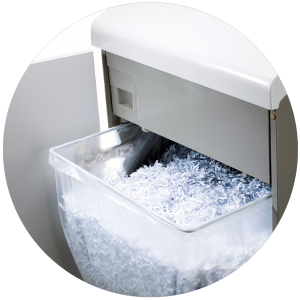 With the exception of the high security line of shredders, all models come with the solid cutting cylinder system which extends the life of your shredding equipment, and reduces over-all costs over the long term. All new Dahle Shredders are Energy Efficient! The Smart Power savings feature puts the shredder into "Sleep Mode" after ten minutes of inactivity.Then powers down the systems after 30 minutes to save energy. The EvenFlow oiling system helps to clean, remove debris, and lubricate the shredding cylinders to extend the life of the cutting system. All CleanTEC cross cut models include the EvenFlow system. High security models in the new Dahle Professional Series shredders include a built in oiler. 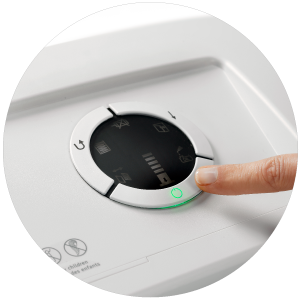 A simple Control Center provides both ease of use and feedback for the user during shredding. Forward, reverse and continuous feed buttons enable the user to quickly process documents with the touch of a button. 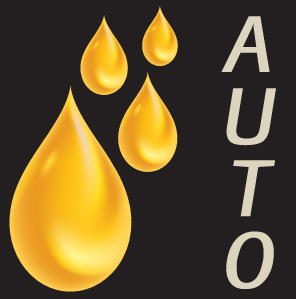 LED icon indicators provide feedback for important information such as: Overfeeding sheet stack, Waste bag full, Oil reservoir needs refilling, and current feed settings. Waste is now filtered directly into a shredder bag, which is held in place by a bag ring. You no longer need to use shred boxes, and can quickly do bag changes in seconds. Simply pull out the full waste bag, replace the bag, and slide the ring back into the cabinet! 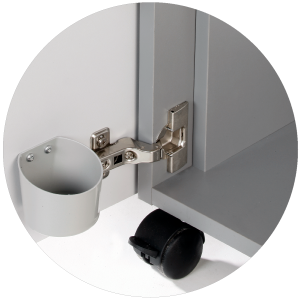 Cabinet door hinges are made from metal and can easily be adjusted when needed. With the locking wheels, you can quickly move the shredder between locations in the office with-out needing a second person to lift. The cabinet door even has a handy oil bottle holder for smaller hand held shredding oil bottles. 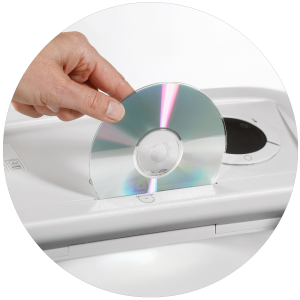 MultiMedia+ Shredding Capabilities in one! When you buy a Dahle shredder, most models are now MultiMedia+ paper shredding capable! MultiMedia capable models include a safety slot for disks, to eliminate small shards from flying up during the destruction process. 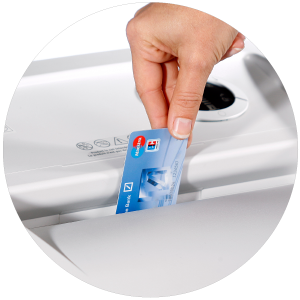 You can also destroy plastic card material such as credit cards, debit cards, smart cards (with microchip) and other security or ID cards.